With new threats coming up every day, websites are now at risk more than ever in the history of the internet. Even if a website takes some measures to make sure it doesn’t get attacked or hacked, there are always some holes that a hacker can exploit. To deal with this problem, some tools and plugins scan and test the websites for vulnerability and holes. You can test your WordPress site now with the free online Security Scanner. One such plugin that is widely used by WordPress users is Security Ninja. 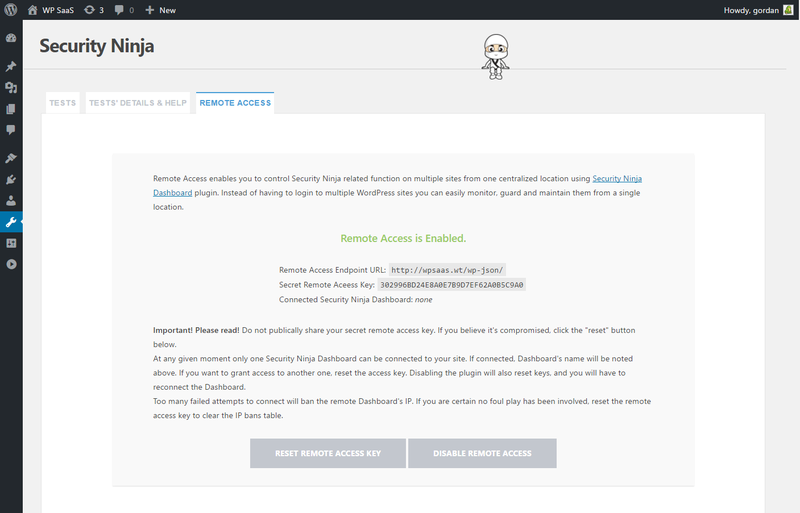 Security Ninja is a plugin for WordPress that is used to test the site for vulnerabilities and security issues that attackers can utilize to do damage. The plugin itself is quite light but very useful; in less than a minute Security Ninja performs a scan after which color coded results are displayed with links to details of the problems and their fixes. Users can benefit from two versions of the plugin; the free version and the more advanced PRO version. Though both versions offer ample protection, the PRO version goes the extra mile providing top notch protection for the site. 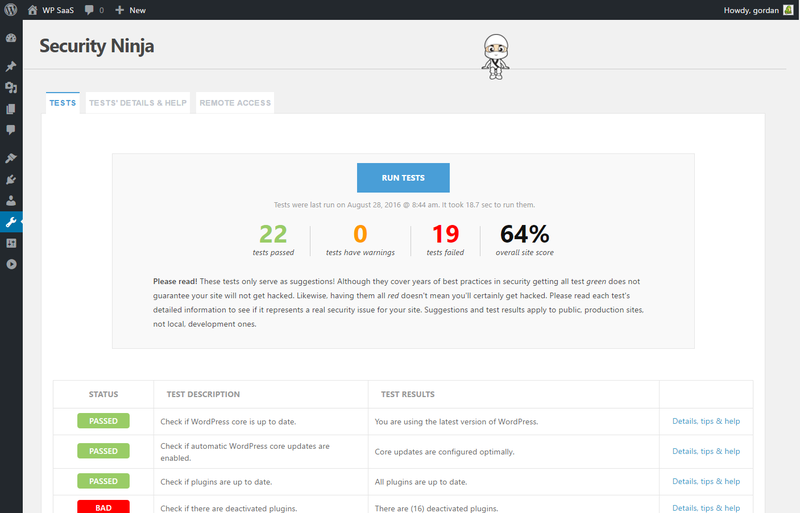 With Security Ninja, there are 40+ security tests including brute-force tests that check your site for vulnerabilities and holes which can be exploited to cause damage. Each test includes the full description and further help is available, these tests allow the users to take preventive measures beforehand to increase protection and reduce the likelihood of a possible attack. Code snippets are included in the plugin itself for quick fixes; however, the plugin provides links for more extensive solutions. And if needed, extra add-ons are available. With the PRO version, special modules are available that increase protection; with the Core Scanner module WordPress core files can easily be monitored and users have a clear view of what files are changed which shouldn’t be, they can be restored with just one click. The Malware Protection Module allows users to scan themes, other plugins, uploaded files and options for possible malware infection. Over 20 tests are done on each file, and exact parts of the file are shown which are infected. With the Scheduled Scanner module, all scans and tests can be scheduled and reports can be sent to the users via email. Moreover, this module automatically alerts users in the event of a hack and is extremely easy to set up. With the Events Logger Module, more than 50 events can be monitored, tracked and logged on the site. Users will be able to know what happened on the site, where, at what time and who did the action. The events are easy to filter through thanks to the easy to use GUI. While writing this, the developers are diligently working on a new module which will be able to automatically fix most of the security issues found by Security Ninja. The PRO version is available in three variants depending on the user’s use, and the free version does not have any such restrictions. Users might experience their site running slightly slower while the tests are being run, but they only last for a minute or less. Security Ninja runs with all themes and all plugins so you won’t have to worry about a thing. It’s been tested on over 5000 sites, it is completely safe to use, and a must-have for WordPress security.